I wanted to start the series of posts by sharing my favorite hot chocolate idea. I apologize in advance as I can’t actually remember where I originally saw it. However, upon searching for it again it appears to be posted in all kinds of forms across the internet with momendeavors looking the best. The author Sara – a mom to 3 as the subline reads – shares her explicit love of norm of the north ( a funny polar bear film) by telling us how to make this delightful polar bear toppings from a large marshmallow; m&m nose and sweetie eyes. I find these very cute and wintery. 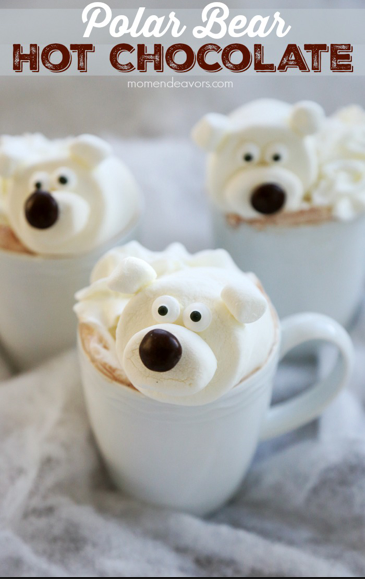 The polar bears give the hot chocolate a goofy, humorous touch which I’m sure children and teenagers will delight over. Or recoil from in embarrassment; you never can truly tell which. Personally, I’m the teen type that doesn’t actually like large marshmallows, so am choosing not to follow this recipe and will instead be creating my own version of it. However, if you’d like to try your hand at making the polar bear marshmallows shown above momendeavours has the perfect step by step guide with plenty of suggestions to help you do so. If not you can choose to follow my own hot chocolate recipes on Wednesdays.